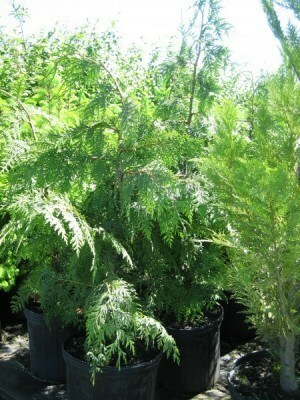 Habit: large columnar evergreen tree with an irregular to conical crown, older trees frequently have many leaders. The trunk is sometimes flared out near the bottom (buttressed) with reddish brown to gray bark that is fibrous and vertically ridged. Branches droop slightly and arch upwards towards the tip, branchlets are widely flattened and pendulant. The yellow green leaves are lustrous, dense and scale like with a spicy fragrance when crushed. 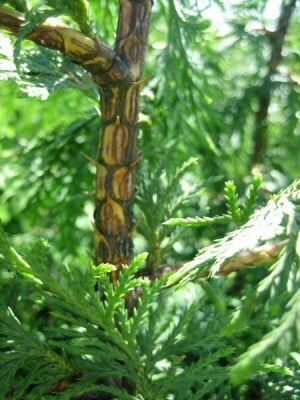 Small seed cones are brown, woody and in small loose clusters, individual cones having 8-14 scales. Some leaves have a red-brown-green color in winter. 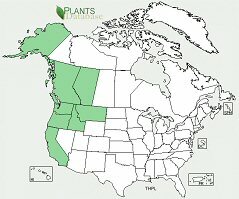 Ecology: found in either of the two main montane regions, one occurring between the Coast Range and Cascades from British Columbia to Northern California, the other in the Rocky Mountains from Alberta to Idaho. 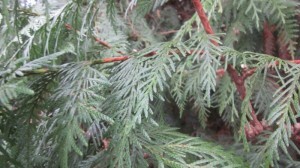 Western red cedar is commonly found in moist sites, wet ravines, streambanks and swamps, and in shady mixed coniferous forests preferring places with rich soil at elevations from sea level to 7513 ft (2290 m). Growing Conditions: full sun to partial shade, in moist to wet well-drained soil. 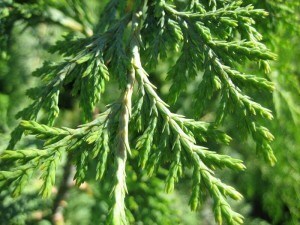 Regarded as a very powerful and useful tree in many Native American societies, western red cedar was used ceremonially as well as in the construction of many things from canoes to clothing.